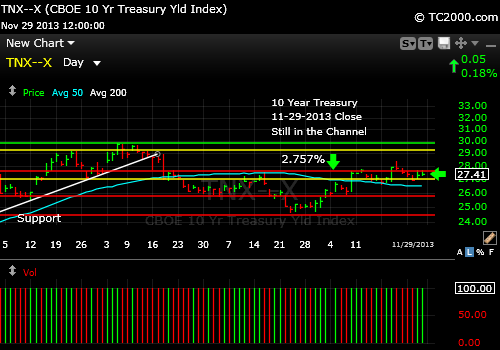 The 10 Year Treasury yield playing with a specific number on the chart and that is the 10-16-13 yield high of 2.757%. Above there and rates are technically rising and below there, which we are at the moment, rates certainly have a chance to fall. After all Santa Ben is there with his big bag of US dollars. A QE taper in December would shock the markets by the way, if you are looking for a reason for a sharp correction in stocks. The chart below will determine the direction of gold in the near future (see gold chart link to the upper right). Rates on the cusp. The number to follow is 2.757% for the next few days.